Last week, Google kicked its own social network Google+ at least five years into the future with a huge makeover – it didn’t please everyone and there are still some issues to be worked out, but overall it’s a great evolution of a social network which has always been far ahead of its competition. But there were two other huge updates in the mobile world this week: first Google updated the Google+ Android App and then Opera followed with the completely new version of Opera Mobile. Both are pretty substantial updates and show that the companies are not sleeping when it comes to porting their programs to Android – especially compared to some other tech giants, who can’t seem to get their act together. But these two are doing it right and are first and foremost listening to their users. Google+ version 4.0 is actually not such a huge update like the jump from 3.5 to 3.6, because this time Google has just implemented the changes from the new version of the website in the mobile app. The new layout introduced with 3.6 was actually the basis for the website redesign, so there are no huge surprises here other than the integration of hashtags and trending topics into the stream. But there have been some huge improvements under the hood: rendering speed is now much better and while loading still sometimes takes a few seconds on low-end devices, there are no more problematic slowdowns. The biggest improvement is, however, the ability to access and manage the Google+ photo albums, which means that it is now possible to share photos that not only have been taken with the internal camera directly from a mobile device. Unfortunately it is not (yet?) possible to share images from the device’s sd-cards or even from an external server, which should really be implemented. 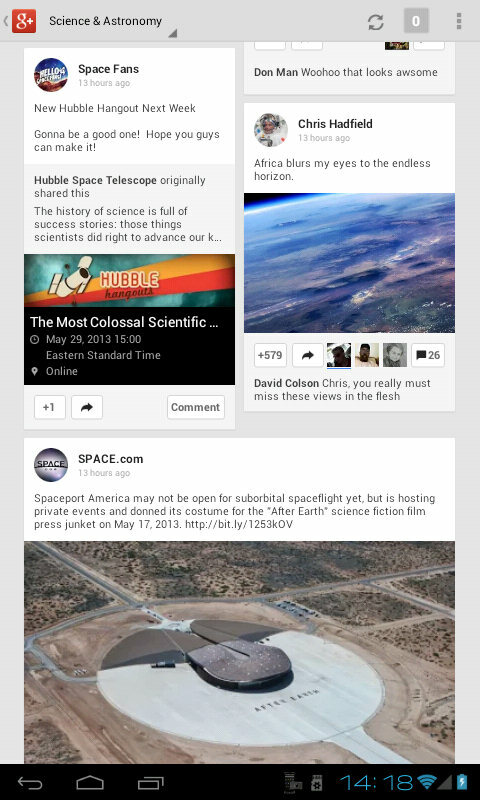 Otherwise the new version now feels much more mature and makes working with Google+ on mobile devices very comfortable. Opera Mobile has been the best browser I’ve encountered so far on Android, but the user interface of version 12 was clunky and not really suited for larger tablets. When Opera had announced a while back to switch their mobile and desktop versions to Webkit, I was somewhat concerned about the performance on my low-end tablet, but the beta versions of Opera Mobile 14 with the Webkit engine had proven otherwise. I had already completely switched to the new version and gladly updated to the final – I was, however, a bit miffed when I discovered that not the beta 14 was upgraded, but my installation of the old version 12. Luckily, all the bookmarks were imported in a legacy folder in the Speed Dial system, so nothing was lost. I didn’t miss the old version in the least, especially when I discovered that the final release, which was updated once more on Thursday, had become even faster and more stable than the betas. The user interface is extremely minimal and the final version has switched to a fullscreen mode in which the address-menu-bar scrolls off the top – exactly the feature I was waiting for! No bookmark system has been implemented, only the speed dial, history and a somewhat useless “discover” page with links and news are available. 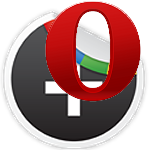 Opera has not yet managed to connect the new browser with its own Opera Link service, only providing a link to the web interface. Also, there is still no progress indicator, which makes the actually faster loading times seem longer. Unfortunately, Flash is no longer supported – but that was expected since Adobe also has ceased to support Flash on Android. If Opera fixes the user interface a bit and gets a real bookmark system going, Opera 14 for Android could become the best browser for the platform – it’s already 90% there and Opera has just said today that they’re listening to their users and are working on it.